When critical equipment fails at the worst time, what can you do? “I inspected the belt and saw that it wasn’t something we could easily fix on our own. It needed expert repairs. I called Cisco-Eagle and left message requesting a tech for emergency service. 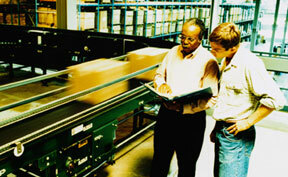 “While the line was down, our people moved sections of flexible conveyor into place to bypass the dead power conveyor. “Cisco-Eagle returned my call, and I explained the problem,” the facility manager explained. “The dispatcher said he’d send a technician. I called back to ask for an ETA. The tech was on his way, but had to stop and pick up a belt splicer in case it was needed. He estimated 60-90 minute to get here. “The technician arrived to begin repairs. He removed the cover, chain, sprocket and dust pan underneath. He unwound belt from drive roller, repositioned and re-pinned the belt. End splices were intact and did not require re-splicing or extensions. The belt was good did not need to be replaced. Less than an hour after he arrived, he had the conveyor running again. “I want to recognize that your technician, Ben, did an outstanding job resolving the issue. I appreciate his skills and sense of urgency.